Thirty years ago today, a movie with a very recognizable cast opened in theaters. It wasn’t a big hit, and has since all but faded away to a point where it’s very difficult to watch anywhere legally. And that’s a damn shame, because Space Camp was, and remains, a fine piece of popular entertainment. Two years after her breakout role in Indiana Jones and the Temple of Doom, Space Camp stars Kate Capshaw as Andie Bergstrom, a smart, capable astronaut who has yet to make it into space. After missing her latest window she and her husband (played by Tom Skerritt) bring their NASA expertise to Space Camp, which is exactly what it sounds like—a summer camp where kids learn what it takes to be an astronaut. Andy is given a team of five kids as her crew, and it’s literally star-studded, whether you watched the movie then or now. You’ve got Lea Thompson, a year removed from Back to the Future. You’ve got Larry Scott, two years after both Revenge of the Nerds and The Karate Kid. You’ve got Kelly Preston, two years before breaking out in Twins, and the feature film debuts of both Tate Donovan and Joaquin Phoenix. Yes, that Joaquin Phoenix, here at the age of 12, then going by the name Leaf Phoenix. Oh, and did I mention the score is by John Williams and is awesome? Because that’s true too. Jinx, the robot that sets the whole story into motion. That’s a pretty stacked line-up already, but it still gets better. 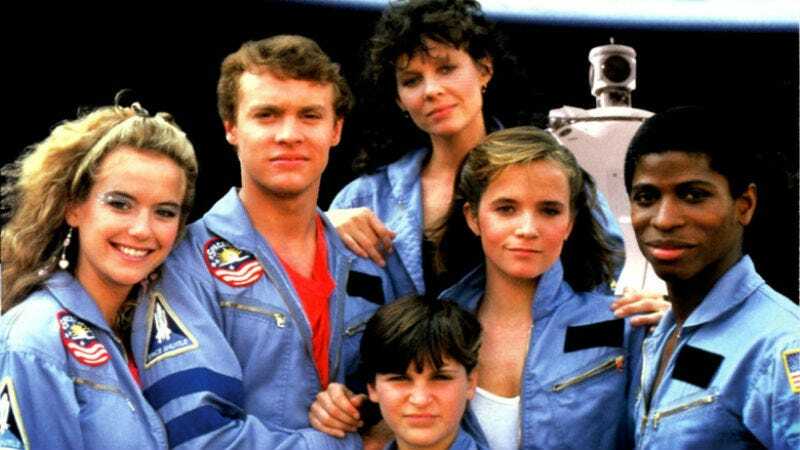 The basic plot of the movie is the best kind of ‘80s wish-fulfillment fantasy, as these kids, mere space campers, literally get to go into space after Phoenix’s character, Max, makes friends with an artificially intelligent robot named Jinx who tricks the NASA computers into forcing a routine maintenance test into a full-on launch. It’s far-fetched, sure, but somehow it never feels like it. Part of why Space Camp works is everything in it fits very nicely. First, the movie efficiently sets up all the characters mentioned above. We learn about their motivations, strengths, weaknesses, and then, once in space, the film never eases up on the drama. Because this wasn’t a ready-for-flight space shuttle, none of the essential systems or fail safes are online. So Andy and the kids, who have mere weeks of training, encounter a seemingly insurmountable and escalating list of problems, including lack of oxygen, no communications, missed landing windows, and more. The second half of the movie is basically PG-13 hell in zero gravity, which makes for a great contrast from the fun, happy-go-lucky tone of the first half. Space Camp also has a real sense of wonder about it. Some of that is Williams’ score, some of that is a cast that’s just really good (Lost’s Terry O’Quinn also makes a brief appearance) but most of it is just the time and place it was released. This is a movie that’s very 1986. The music, the clothes, the attitudes, the non-stop references to Star Wars—somehow it just feels real and relatable. Plus. the camp itself is a really fun world to explore in a movie. We’re given interesting facts, presented with cool tech, and it just feels ultra optimistic. This is a place you really want to visit. Space Camp is undeniably ‘80s, and that’s why we love it. On the other hand, with a release of June 6, 1986, Space Camp was mainly filmed before the horrible tragedy of the Challenger shuttle in January of that same year. It was a time when the space program, and NASA, were still kind of the pinnacle of cool. That tragedy, however, most likely numbed the movie-going public on a film about a bunch of kids on a space shuttle who are constantly in danger of exploding. Hence the $9 million box office total, good for the 74th biggest movie of the year. But Space Camp still works. It’s funny and dramatic with a dash of romance. There are mostly seamless visuals and practical effects to simulate space. Edge-of-your-seat tension builds multiple times in the final act of the film. It’s a movie that should have been a big hit, something people still talk about today. History, however, wasn’t so kind to it. So today, on the 30th anniversary of Space Camp, I want to give it some well-deserved and long-awaited props. This is way too good of a movie to get lost in history. It’s not just a stellar family movie, it’s movie anyone can enjoy. There are strong characters of both sexes and multiple races. It really has it all. And did I mention John Williams wrote the freaking score to this movie? Space Camp was great when it came out and it’s still great now. Seek it out if you can find it—you won’t be disappointed.